A few months ago I found a couple of disposable cameras in a thrift shop; they had expired in 2001. The first camera produced a set of duds, but I had a few pleasant surprises with the second. This grainy, gloomy picture was not one of the pleasant surprises, but I wanted to mention an event that my friend Carole graciously invited me to last week. The Society & Balenciaga brought Ivan Rodic, the Facehunter, to Toronto. I thought I "Why not?" because after all, he is a blogger, like I am, sort of, and even Geoff had found some inspiration in his photographs. The event was held at The Room at The Bay; we had ribbons scented with the new Balenciaga fragrance tied in bows around our wrists. I saw so many fancy cameras and fancy flash units and fancy lenses in use, but I whipped out my expired disposable and took this picture. Whatever. It's not the sort of event I go to regularly, of course, and it was quite fascinating from a people-watching perspective. As to the Facehunter himself, he seems all right, and I bought his book. It's always amusing to me when someone like him becomes the toast of the fashion crowd. I don't think he cares too much about it. Anyhow. Let's get confessional here. I felt incredibly unattractive all evening and proceeded to drink quite a few glasses of sparkling rosé. If you have image issues and break up with your therapist in the same week that you attend an event filled with incredibly beautiful & possibly wealthy people, you end up standing quite close to the bar (n.b. voice of experience). We were given small bottles of the perfume in a gift bag. I love this perfume. I can't quite identify it, but there is a note in it (possibly the violet) that reminds me of something I've smelled before. The exact memory hasn't yet been triggered. After the event I met up with some other friends at the Bad Day magazine launch, where I took this gem. The next day Geoff and I went to High Park to see the cherry blossoms. Despite the fact that the sky was overcast and the fact that they weren't quite in their fullest bloom, it was incredible to see the tufts of blushy-pink-white peeking through the other trees. 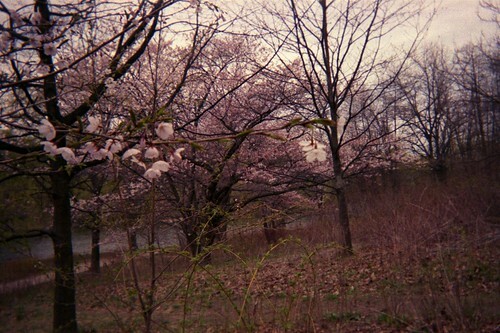 The disposable camera produced these rose-tinted pictures that are so beautiful to me. Miss Crowland: I do work there, but not in any sort of public area. The stacks are card access only, but there are some open floors. Melinda Josie: You're welcome -- I hope you made it! tara-lynn: Oh, I know -- these ones are already gone. Julie: I don't think the link is confirmed, but it is a possibility. I know that Umberto Eco has quite a few friends at U of T, including one popular professor of semiotics who is originally from Italy. Jess: As I said above, I don't work in a public area, but I do spend way too much time in the lineup for coffee! jessica: Oh I bet. It's nice that you have that! miss sophie: It's so beautiful when things start to bloom. The bright, lime green of early leaves is so pretty! nice-etc.com / caitlin: Oh, I wonder why! Ours were so delicious and we usually had more than we could eat! My parents would gather bushels of them and distribute them around the neighbourhood. Amazing tree. 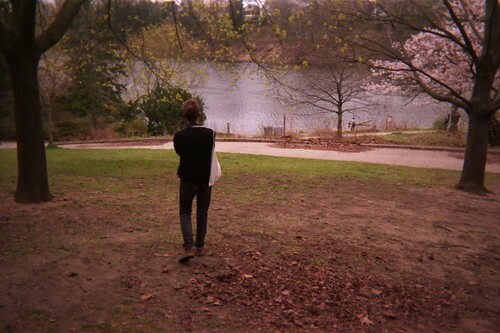 nath: I think spring is better than summer, personally! Summers here are very humid and it can get oppressive. Fee-AMore: I agree! Nature is great. erica-knits: Oh, I'm glad you went! I read somewhere that Toronto's climate is nearly too cold for cherry trees, meaning that cities that are even a little more cold can't have them at all. It's so nice to have them! I feel lucky to have had that tree in my childhood, because when we moved away when I was a teenager it was at the point where it was producing fewer cherries. erin: Thank you, and you're most welcome. SJ: It looks so amazing in Japan! I hope to see it sometime myself for real... but I may have to wait a long time. ilovesasek: That's so funny... I hate Robarts! Fiercely. Although that could be because it has been a presence in my life since 1999, and I have spent entirely too much of my life inside it! I once had a carrell, and I did love that. Sarah Knight: I love them too. You are so beautiful Anabela. I am certain that others at the event were looking at you and feeling inadequate themselves. Plus, self image issues aside, it is always a good idea to take advantage of free sparkling rosé. 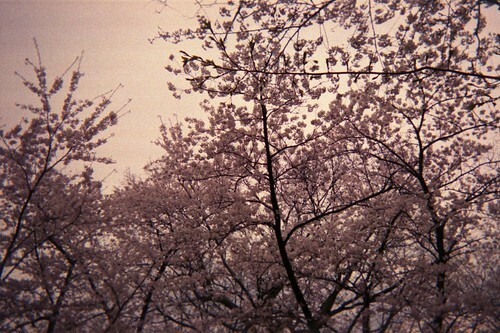 oh those cherry blossom images are really really nice..you should do something with those? really dreamy..love the dim light. we don't have cherry blossoms where i love, but we do have japanese magnolias ... a close substitution. happy spring, anabela! you are beautiful! remember that. What a wonderful photography project. You have inspired me to take photos with an old camera I picked up at yard sale now before I have it worked on....it might make some interesting photographs. Your pictures are excellent. I love them. 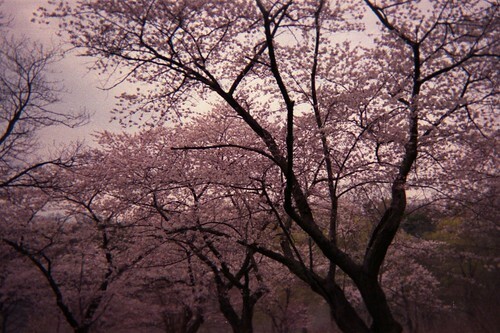 The cherry blossom photos are very lovely with that accidental yet perfect rose wash. I still cannot get over how gorgeous these photos of yours are. The pink is so lovely. As for the insecurities, I understand them. It makes me nervous to walk to Whole Foods, I feel like I'm being judged the whole way. Especially when I wear that H&M jacket that so many people have! I'm so glad you went to the party, drank the rosé and got a gift bag! I understand insecurities in those situations, but do know, that you are beautiful. Not to mention: Those smokey eyes, hot! i love the dark, dreary tone to the tree photos. sometimes shooting on a cloudy turns out to be the perfect conditions. These are so lovely! You have a great eye! 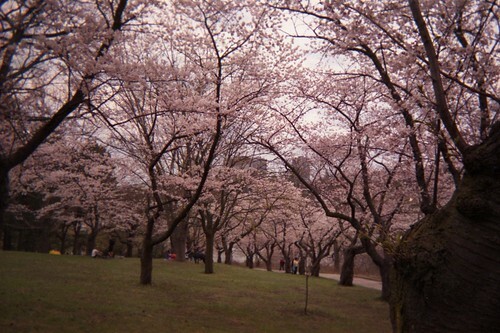 Your cherry blossom photos are gorgeous- just like you! I would be so nervous to go as well. I know it's easier said than done, but don't be so hard on yourself. You are one gorgeous lady inside and out. Love the pictures too! anabela! 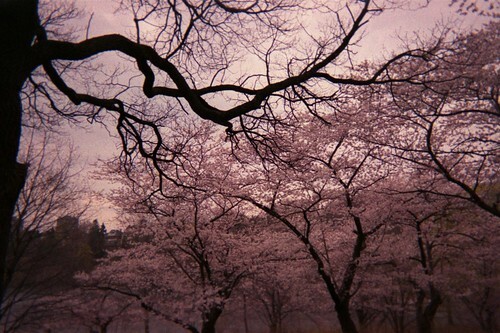 the cherry tree photos are so SO pretty! 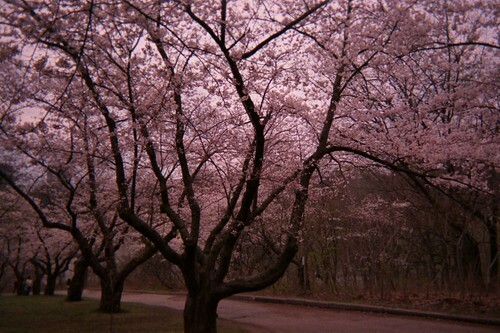 i am usually a sucker for weirdly tinted photos, but the rosy glow over pretty cherry trees is just pure romance! I absolutely love these photos. The Balenciaga bag is hotness. This reminds me to develop some old film in my Lomo! ekkk!